Embrace it. Indulge in it. Revel in it. March Madness is upon us. And unless you are terribly out of “the know,” than you know the Oregon Ducks play Oklahoma State in the second round of the NCAA Tournament today at 3:50 p.m. on TBS. 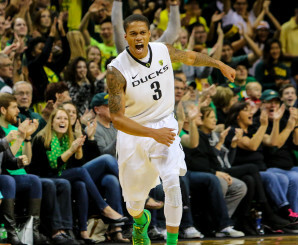 Win or lose, this season has been a pleasant surprise for Duck fans everywhere. Mighty Joe Young has been the leader for the Ducks all season. With only three returning players on scholarship, Oregon looked to be headed into a down season at the beginning of the year. As things turned out, the Ducks were able to find their rhythm late and finish the season strong at 25-9, and second place in the Pac-12 in both the regular season and Pac-12 tournament. With an undersized team of freshmen and transfers that only goes eight or nine deep, their run to the NCAA Tournament is more than remarkable. Senior guard and team leader Joseph Young has been to the big dance before, and so has junior forward Elgin Cook, but for the rest of the Duck squad, this tournament will be a great experience to build off of moving forward. The Oregon freshmen have shown they can hold their own this season, however. Freshman shot-blocking-stud Jordan Bell is Oregon’s best post player averaging 6.1 boards per game and 2.1 blocks, forward Dillon Brooks averaged 11.5 points per game and 4.9 rebounds per game this season, and guard Casey Benson has shown good basketball IQ all season and is second on the team with 2.0 assists per game. These freshmen will be key players for the Ducks in the future, add them with Cook and Dwayne Benjamin (who will be seniors next season) and the Ducks will have an experienced unit ready to compete for a Pac-12 title and make another run in the NCAA Tournament. Playing your best basketball as the season comes to a close is the perfect recipe for a strong season next year, and that’s exactly what Oregon has done. 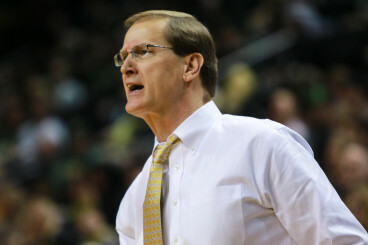 Winning 11 out of 13 games has gotten Oregon into the madness as an eight seed; but regardless of how far they advance, this season has shown that Dana Altman is a superb coach capable of leading an inexperienced team to new heights. For a squad that will be without Pac-12 player of the year and scoring sensation Young next season, an NCAA Tournament run was exactly what the young Ducks needed to build off for future success and future runs toward March Madness. These Duck have surprised many this season. Next year there will be hopes of a repeat performance. Oregon already has a school record three straight NCAA Tournament appearances, but with the experience the team has gained this year, a fourth straight next year is looking more possible every day.